Putting mulch down around trees and shrubs is a very good method to help reduce landscape maintenance and keep your plants healthy. Some reasons for this is because the mulch helps to conserve moisture by giving the soil a 10% – 25% reduction in moisture loss from evaporation. Therefore reducing the need for excessive watering. Mulches serve as an insulating blanket for the soil, keeping the soil warmer in the cold climates and cooler in the hot climates and promoting the growth of soil microorganisms and earthworms. It also helps to keep the soil well aerated by reducing compaction from the rain beating down on the soil, which helps to reduce runoff and soil erosion. Mulching around trees and shrubs can help to eliminate getting close to the trunks and root systems with power equipment, by providing a physical barrier that prevents the trees and shrubs from being damaged by mowers, weed whackers, etc… When mulching an area you should include as much of the root zone as possible. If you are mulching an individual plant, shrub or tree, the mulched area should extend 3-6 feet from the base of the plant, tree or shrub. When mulching bed you will want to mulch the whole area. The generally recommended mulching depth is a 2-4 inch layer after settling because this will adequately prevent most weeds from germinating, and should be applied in a weed free soil surface with a weed barrier in between the soil and mulch. Just covering up perennial weeds with the mulch will not prevent their growth. 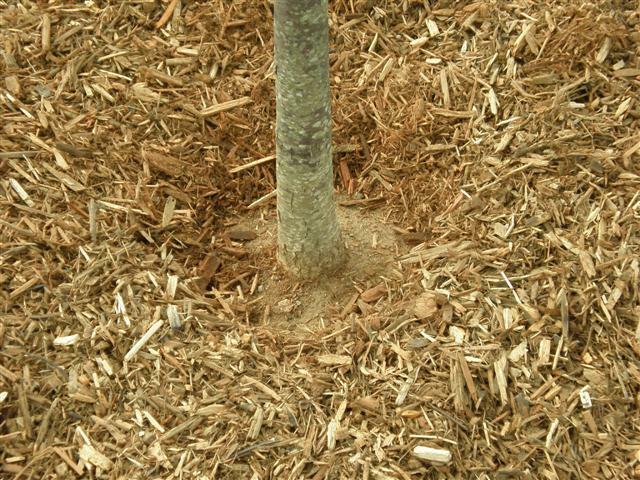 Deep mulch can lead to excess moisture in the root zone, which can stress the plant and cause root rot. Additionally, mulch piled high against the trunks of young trees may create habitats for rodents that chew the bark and can girdle the trees. 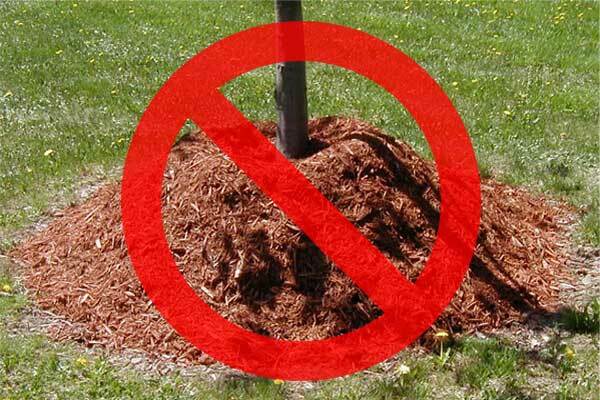 It is advisable to pull the mulch 1 to 2 inches from the base of plants to prevent bark decay. 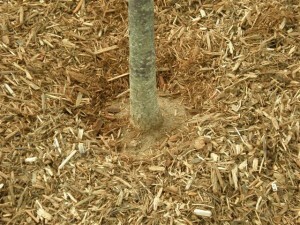 Mulch depth depends on the type of material used and the drainage and moisture holding capacity of the soil. Sandy soils dry out quickly and often benefit from a slightly deeper mulch layer (3 to 4 inches). Mulch can be applied any time of the year. However, the best time to mulch is late spring after the soil has warmed. Early spring application will delay soil warming and possibly plant growth. 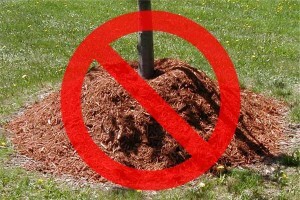 It is not necessary to remove the mulch when you fertilize. Apply the fertilizer over the mulch — nutrients will move with water to the roots below.